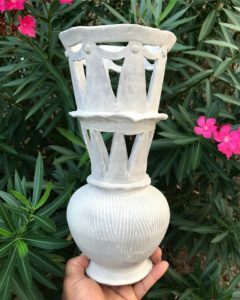 The carving and color selection of Osa Atoe's pottery allows her creations to be easily recognizable. Photo by Collin Richie. From punk rocker to pottery goddess, Osa Atoe is taking Baton Rouge by storm with the terracotta bowls, plates, planters and more that make up her business, Pottery by Osa. After making the short move from New Orleans to Baton Rouge, Atoe has seen her business and creativity flourish among the popular arts markets and creative organizations of the Capital City. We sat down with Atoe to learn more about the inspiration behind her one-of-a-kind creations. 1. What is a typical day like for you? ​My typical day keeps changing as I move through my ceramics career. When I first started, I would make pottery from home in the mornings and evenings around my art teaching gig in New Orleans. Once I moved to Baton Rouge, I left that job and was able to spend my entire day working on pottery and all that goes with it: updating social media, email and Etsy correspondence, packing and shipping, etc. This fall, I started a post-baccalaureate program in the ceramics department at LSU, so four afternoons a week, I run off to campus for class. 2. What is your professional background? How did you get into pottery? ​I have a bachelor’s degree in sociology and have mainly worked with youth as a tutor, preschool teacher and teaching artist. Creatively speaking, I’ve always been a musician. I started off playing violin in school orchestra when I was a kid and then played in punk bands as an adult. I got into pottery simply by taking a two-hour-a-week community pottery class when I was living in New Orleans. ​3. What is the first thing customers notice about your pottery? The carving. ​4. What sets your pottery apart? ​I have my own style. Not to say that it’s completely original, as not much is these days, but I think the aesthetic of my pottery is distinct, especially on a local level. If you’re familiar with my pottery and you see a piece of it somewhere around town, you’ll probably recognize it as mine. 5. What is one thing you think customers should know about your work that they may not be aware of? ​It takes a lot of time and for every piece you see, there are others you don’t see that failed somewhere along the process. 6. How do you keep your pottery fresh and exciting? The same way you keep life fresh and exciting: adventure and learning. Visiting new places keeps me inspired. I love a good, long road trip but it can even be as simple as discovering a new place in the town where you live. The state of always being curious is equally inspiring and, with the Internet at our fingertips, all questions are easily answerable. For instance, I visited the Rural Life Museum here in Baton Rouge for the first time last weekend and saw some beautiful Chitimacha Indian pottery and basketry that has got me reading about Steele Burden, who owned the land the museum is on, and the different Native American tribes in Louisiana. Maybe the patterns in the basketry I saw will influence my pottery, or maybe the impact on my work will be less direct and more subtle. 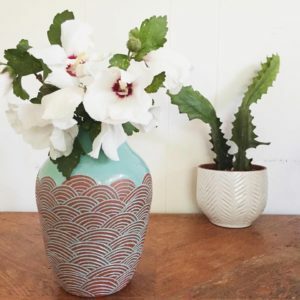 I also think with ceramics, if you want to keep it fresh, you can’t be afraid to start over with a different clay body, different techniques, all new glazes, etc. It can be hard to experiment much when you’re also filling orders and trying to run a business, but it’s something you have to just promise yourself you’ll always make time for, even just a little bit. Watching other people work is also really helpful because everyone approaches their materials in their own way. ​7. Can you share a hint about what customers will see from you in the future? Right now, I’m kind of making two bodies of work: The work I make at my home studio, that I sell at art markets and on Etsy, and the work I’m making at school, just for the sake of making it. In my school work, I’m doing a lot of exploration and experimentation that should lead to some exciting, new results for me. ​8. When did you start your business, and how has it grown or changed since then? ​I started in the spring of 2015 when I was living in New Orleans. I had no idea that this would be the case, but moving to Baton Rouge in 2017 was actually a great business decision–even though the decision to move here had nothing to do with business at all. 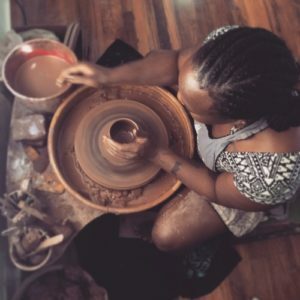 Since I’ve moved here, I’ve had greater success at art markets and I’ve even been able to find a bit of a ceramics community through LSU and ​organizations like Louisiana Claymates and The Journey Lab. 9. What is a must-have piece for this season? ​My mask jars! I only make a few of them each year–and typically in the fall and winter. They are ceramic food storage containers, but the lid is an African mask with the nose as the handle. The larger ones come with a scoop that hangs from a small arm attached to the body. You can use it for grains like rice, oats, popcorn, etc. ​10. What is your best-selling type of piece? ​Customers both at art markets and online love my terracotta one-piece planters. They work great for succulents and I notice people buying them frequently as gifts. To learn more about Atoe and her creative journey, check out this story from the October issue of inRegister. You can also check out Atoe’s work on her website, Facebook and Etsy.